In the last month or so I've been using the phrase "being loved by words" or "being loved by a book." I don't know if that works or not. Some might think it sounds goofy. It does, however, capture how I felt, reading the stories in Love Beyond Body, Space, and Time: An LGBT and Two Spirit Science Fiction Anthology. It is definitely a book I recommend to young adults. The emotions it brought forth in me are spilling over again and again, of late. I don't know what to make of that tenderness that I feel, but it is real. I've thought about it a lot since first reading it, trying to put words to emotions. 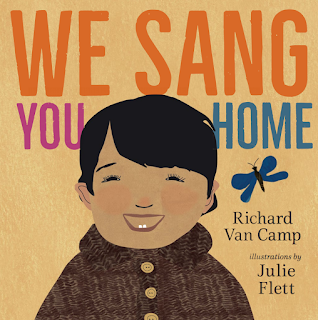 Richard Van Camp and Julie Flett are Native. I've read many of their books and recommend them over and over. Working together on this one (their first one is Little You), or apart, the books they give us are the mirrors that Native children need. Just look at the joy and the smile of the child on the cover! That kid is loved, and that's what I want for Native kids! To feel loved by words, by story, by books. 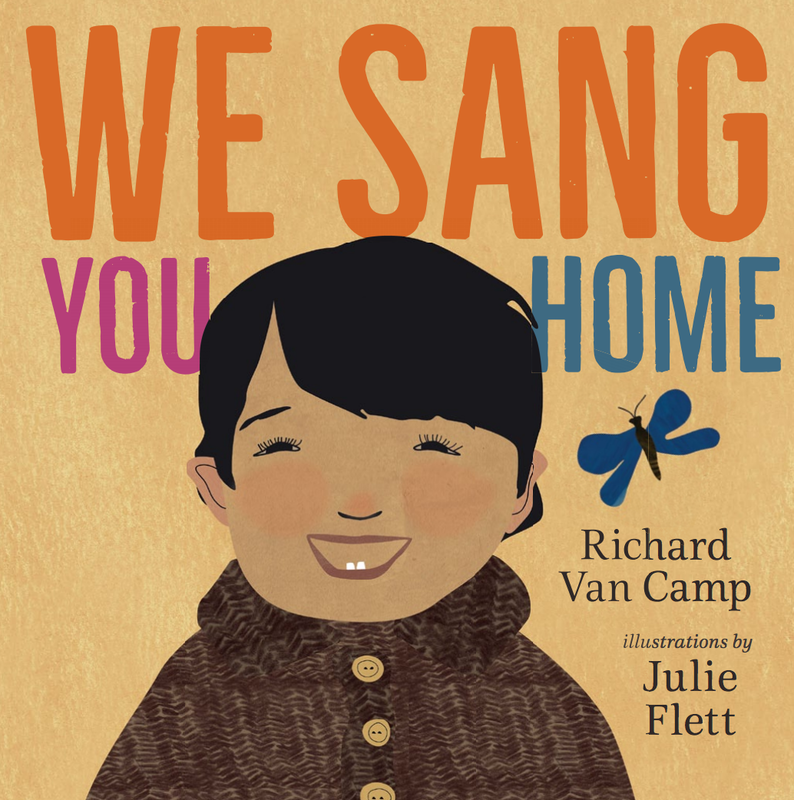 We Sang You Home is a board book that, with very few words on each page, tells a child about how they were wanted, and how they came to be, and how they were, as the title says, sang home where they'd be kissed, and loved, and... where they, too, would sing. 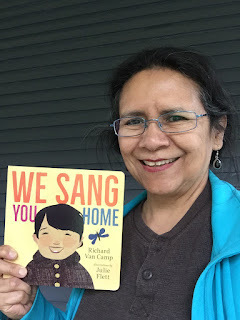 Here's me, holding We Sang You Home. See the joy on my face? Corny, maybe, but I wanna sing. About being loved, by this dear board book. I highly recommend We Sang You Home. Published by Orca in 2016, it is going to be gifted to a lot of people in the coming years. Talley's response to that reader was similar to the one I got from Sarah McCarry when I wrote to her about that phrase in her book (see her post), and the response I got from Ashley Hope Perez when I wrote to her about the phrase in her book (see my post). The line is "Maria was almost as high up the totem pole as Delilah." I'm guessing that the book's title "As I Descended" is a reference to that totem pole. My guess is that Delilah is going to descend from a high point on the social status hierarchy. The book itself has nothing to do with Native peoples. I haven't read it, so do not want anyone to think that this post is an endorsement of the book. I profoundly regret that I used the term this way, and I apologize to any readers who have been hurt by it. Really glad to see another person speak up about this, and another writer and editor acknowledge its use as being wrong! Very glad it’ll come out of the next printings, too, and that it is all being made public for us to know! Thank you, Robin! A thought, though, about apologies. I get why people offer them. They’re a social grace. But sometimes, they carry some things that don’t work. They suggest that __ is hurt by the word that misrepresents their particular demographic, when maybe __ isn’t actually hurt. Maybe __ is just pissed off. Yeah, I know, being angry can be characterized as hurt. Still, though, saying someone of that demographic is the one who should be apologized to suggests they’re the only one who is hurt by the word, when I think everyone who doesn’t know it is a problem is impacted by it. On Twitter, I retweeted her "On Making Mistakes" tweet, and that I had a response to her post (crossing lot of social media platforms with this post!). Talley replied that she agrees with my points. 1) A Native reader wrote to Talley. 3) Talley wrote to her editor. 4) Talley and her editor are revising that line. 5) Talley wrote about this error, publicly. Change happens, when we speak up, and when we listen. With more of this speaking up, and listening, I feel optimistic that change can happen. As I Descended is published by Harper Teen.